I previously posted about some dodgy quality armour the British found in PzIII tanks. Samples obtained from various tanks tended to behave in a similar fashion, but other trials showed that this performance was not exclusive to just one type of German medium tank. The performance of the PzIV's armour against the British 2-pounder was so disappointing, that the British theorized the Germans are saving all of their high quality plate for prospective heavy tanks. "Firing trials by a 2 Pdr. gun mounted in a Mark IVA Cruiser tank have recently been carried out against a captured German PZKW IV 22 ton tank in the Middle East. Tank engaged broadside at 500 yards. All shots on turret and hull side armour penetrated, passing completely through the tank and also penetrating far side. Tank engaged head on at 500 yards. All shots penetrated. 3 shots broke up inside tank. 3 shots passed through tank and penetrated 20 mm armour on far side. Tank engaged broadside at 700 yards. Results as for (a). Tank engaged head on at 700 yards. All shots penetrated and broke up on far side after penetrating 10 to 15 mm. Tank engaged broadside at 1100 yards. All shots penetrated. Tank engaged head on at 1100 yards. All shots penetrated. Tank engaged head on at 500 yards. 6 rounds fired at thick single and double armour. All penetrated, except one. Comment: As a result of these trials, 500 yards is considered the maximum effective range against the thickest frontal armour on this mark of tank. The results of these trials are satisfactory confirmation of the penetrative effect of the 2 pounder. During the winter months the Germans have undoubtedly been making extensive trials with captured British 2-pdr A.Tk. guns and as a result the vulnerable parts on the tanks have been increased by extra plates being welded or bolted on. See summary 3, reference 1/A/(i)-(v). The Germans apparently considered that their tanks had thus been rendered immune to our 2-pdr. In France, the 2-pdr was used with shell and not shot. Against 2-pdr shell the German tanks may be immune, but as these trials show they are easily penetrated by 2-pdr shot at all reasonable ranges. It is hoped that the full details of German armour plate will be available shortly. It is of the machineable type and therefore easy to produce, but does not appear to be of high quality. It must be borne in mind that the heavier types of tank may be made from a superior quality of plate." I wonder what the difference between 2pdr shell and shot was? Was a new type of 2pdr AP ammunition introduced in 1941? 2 Pdr was equipped with a simple shot. No AP cap, No Ballistic cap. PLain old fashioned shot only. A HE shell was developed but never produced or issued in any numbers. Some users of the 2pdr converted 40 mm Bofors shells to have some HE capacity with the 2pdr. The APHE round was made before the AP round in 1936, but they realised it actually had less penetration than the solid shot AP round, which came in service in 1938. One of the problems of the 2pdr (amongst others) was that shells for them were in very short supply. Tanks were almost exclusively armed with shot. (and AT guns too). Also remember that the "puny" 25 mm French AT guns could well take out a MK III or IV tank of the types fielded in the French campaign. Note that CS variants of the British tank units were build with a 3" howitzer in a mount that was interchangeble with the 2 Pdr mount. 1. Not many CS tanks were built and most of them allocated to HQ units and not the tank units themselves. 3. Again, alsmost no HE rounds were produced for the CS tanks , and they were almost esclusively armed with smoke rounds. The idea seems to have been that when a tank unit encountered an AT position, the "smoke" tanks would be send over from company HQ. The CS tanks would then "blind" the AT guns with smoke and the regular tanks could then charge in with machine guns blazing trying to take out said guns. No need to explain that this did not work out as planned :-) . The CS tanks were used as company-level assets, two per company. With an effective range of 2000 yards, doctrine was to place them in overwatch positions to quickly respond to any threats. Smoke was intended to be used to allow the gun tanks to continue moving past the defense, not to close with them. Over time, the proportion of HE varied, with an upward trend line. Eventually, the CS tanks commonly carried half of their rounds as HE. HE production was quite large. The CS tanks sent to Calais famously had no HE, but first-hand accounts state that that was a logistics screw-up, not a lack of shells in England. Thanks for posting this. I wasn't sure there was a 2-pdr APHE shell or when it was used. Here is the British firing graphs of their 2-pdr. 2pdr APHE, AP and HE were available in North Africa in 1941. 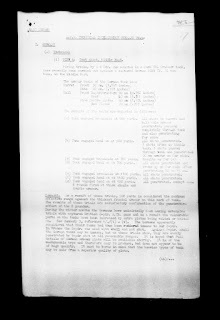 In this thread here somewhere in the 77 pages is a test report against M13/40, where both AP shot and APHR were fired. There is a gun collector who has a 2pdr HE shell case with a 1941 date stamp, so conclusive proof that 2pdr HE was produced, even though the data has been left from production records. In addition, photos show 2pdr HE in use with Australian 2pdr ATG in Tobruk, and the war diaries of Australian A/T Batteries in Malaya in 1941 specifcally mention 2pdr HE, lots of it, that they brought up to finish flimsy Japanese tanks that wouldn't brew up with solid AP. I did provide all the links to these references some years ago in the TOE Group on Yahoo, which is still active. 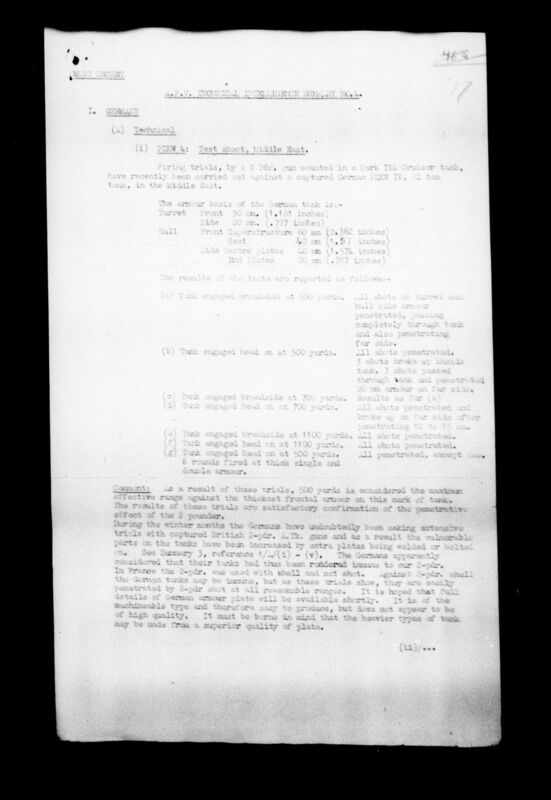 Notice that archival charts showing 2pdr ammunition production merely have blanks for 1940 and 1941 HE, not zeros. I've read assertions that the different size of the HE shells made them incompatible with the ammunition racks in the British tanks. There were optional ammo racks for HE, but installing them required removing the racks for AP. This was long and involved, so it was never done. Interesting, I saw some complaints about length of shells in Fireflies (the Sherman Ic couldn't fit the longer APCBC rounds in some slots), but nothing about 2-pounders. That'd be some horribly disjointed engineering... and thus sounds entirely plausible for early Britisher stuff, given their gun and tank designers apparently didn't talk to each other very much.